Bharat Sanchar Nigam Ltd (BSNL) has launched a low cost version of its smartphone. It was launched at Bangalore / Bengaluru on First week of June 2014 by Mauritius President Rajkeshwar Purryag who was then on visit to India. 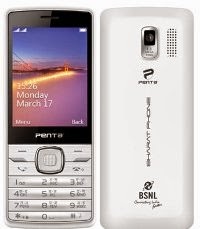 The Phone was designed and developed by Pantel Technologies Ltd in association with BSNL. This ultra slim mobile phone is targeting common people by providing them access to the internet world at an affordable price through phone. The phone will have the facility to browse, e-mail, to check Facebook and download music, Java games and videos. It has a three-inch large screen display and dual SIM card facility. The phone will have a price of Rs 1,099.